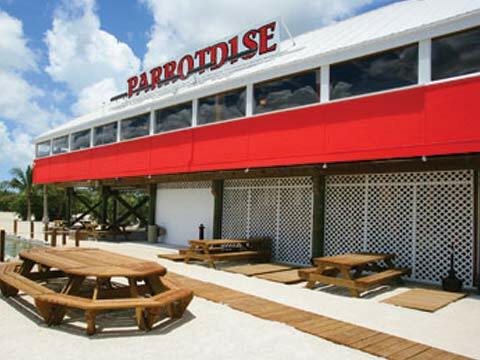 If you are traveling South on the Overseas Highway, Parrotdise can be seen from the bridge on Pine Channel. Located on Little Torch Key, 183 Barry Avenue at the 28.5 MM. The First Street South of Big Pine Key on the Bay Side. Come by boat or by land. Parrotdise Waterfront Bar & Grille. Enjoy eating inside or outside on the Beach or on Picnic Tables outside. Walk the dock and try to spot the snapper, barracuda, tarpon, nurse sharks, rays, needle gars, crabs, lobster, octopus and many other creatures that are visible from the 300 foot dock.